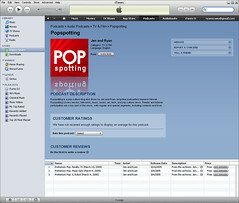 Though Popspotting isn’t set to debut until Summer 2010, you can take a trip down memory lane today by subscribing to Popspotting in iTunes. We’ve added over 40 clips of the “Pith of Pop” segments we recorded for HawaiiUP. Fair warning, though… this is a flashback to the early days of podcasting, and our early days behind the mic. Revel in the low-bitrate rambling, but rest assured, Popspotting will be a completely different experience. And a better one, hopefully! We may also slip some extras into the feed over the next few months. As an added benefit, of course, you’ll be the first to get Popspotting when it launches!